In Matthew Heineman’s City of Ghosts, freedom of the press is a matter of life or death. Raqqa, the Syrian city at the heart of Matthew Heineman’s new film City of Ghosts, made headlines in early 2014 when ISIS forces invaded and declared it the “capital of the Islamic State.” In recent weeks, as City of Ghosts began a limited release in the United States, Raqqa returned to the front page. American-backed forces began pummeling the ISIS stronghold in early summer, and after its recent “victory” in the Iraqi city of Mosul, the US-led coalition has identified Raqqa as its “new number one” objective. The Western media have declared the fall of ISIS in Raqqa to be imminent. Waging this war has been Alhamza’s work since April 2014, when he and several colleagues founded Raqqa Is Being Slaughtered Silently (RBSS), a citizen-journalist collective dedicated to documenting the atrocities in their city. In the film, Alhamza recalls the arrival of the black-bannered ISIS convoys. By then, the residents of Raqqa had weathered an uprising and numerous clashes between warring militias—not to mention decades under the Assad regime—but these new occupiers, he says, were uniquely sinister. “We quickly realized this group was unlike anything the world had seen before. They painted our city black and shrouded it in shadows,” Alhamza recalls in the film. ISIS quickly imposed draconian rules, banning smoking and forcing women to don veils and black shoes. Before long, ISIS staged its first public crucifixion. From that moment, violence proliferated, as ISIS transformed public squares into the sites of grisly executions. Horrified, Alhamza and his friends began capturing this violence on film and uploading it to social media. The act was reflexive, like a “scream,” he recalled. At the time, none of the members of RBSS had a background in journalism. Their aim was simple: to document and disseminate the horrors of life under ISIS in order to undermine jihadist propaganda and summon the concern of the outside world. Truth-telling, they reasoned, was the antidote to international indifference. Heineman’s film employs this method, too. Much of City of Ghosts is composed of the stark footage gathered by RBSS’s guerrilla reporters. Decapitated bodies, bloodstained pavement, and bombed-out homes appear, and often linger, onscreen. The film also captures the deteriorating conditions of civilian life: uncollected garbage, a crumbling economy, and long lines of children waiting for rations of food and water. Highlighting these deprivations has been another pillar of RBSS’s mission, serving as a direct challenge to ISIS propaganda that touts Raqqa as an Islamic utopia. Once they began their work, RBSS members found their lives becoming much more perilous. As the ISIS occupiers continued to slaughter civilians, RBSS became more defiant, going so far as to taunt their occupiers with anti-ISIS graffiti and a satirical magazine. “We didn’t realize how dangerous this work was,” Alhamza told his New York audience. But that revelation came swiftly: A month after its creation, RBSS lost its first member, Al-Moutaz Bellah Ibrahim, to an ISIS assassination. “After we lost Al-Moutaz, we saw we had to take security much more seriously,” Alhamza said. Members of RBSS made clandestine trips to Turkey, taking classes in encryption and data protection and returning to educate their colleagues. Others, including Alhamza, found it necessary to flee abroad, continuing their work as liaisons between the international press and those still in Syria. As the international media began picking up RBSS’s reports, ISIS intensified its hunt for the dissidents, distributing their names and photos online, stopping civilians to search them for camera equipment, and tracking cell-phone signals inside Raqqa. Local RBSS members moved ever further underground. To upload their footage and contact their team abroad, they resorted to using satellite Internet, operated furtively in the back of moving vans. 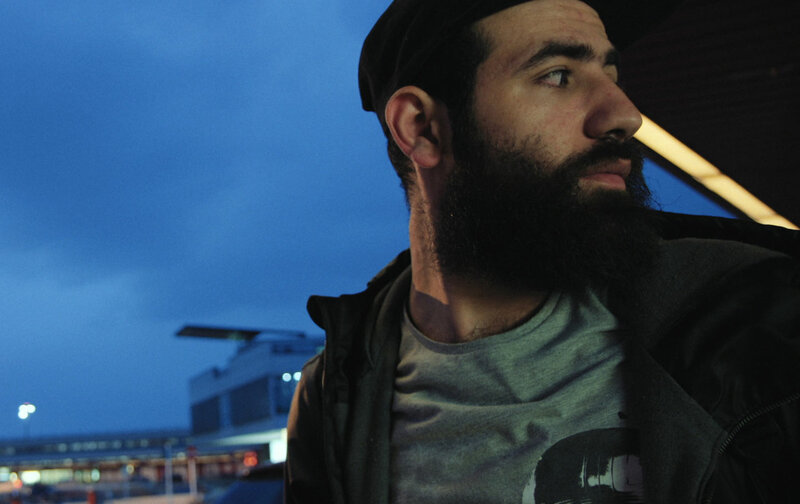 In making City of Ghosts, Heineman spent months with Alhamza and other members of RBSS outside Syria, developing a trust with them that translates into many intimate moments onscreen. The camera rolls as the men huddle around a cell phone in a nondescript hotel room in Turkey, straining to hear the garbled voice of a compatriot on the line from Raqqa. After the signal drops, their faces darken with concern. Cigarettes are lit. The silence is broken only by the staccato sound of fingertips on keyboards. In another scene, RBSS member Hamoud sits in front of a laptop, watching a short film custom-made for him by ISIS. In the film, his father, clad in an orange jumpsuit, confesses that his son has become an enemy of the Islamic State. In the next scene, he is tied to a tree and repeatedly shot. Heineman’s own camera draws closer. Hamoud’s face is inscrutable as he vows to redouble his efforts with RBSS. He reflects, quietly, that his camera is “more powerful” than the terrorists’ weapons. It is for this reason that, no matter what befalls Syria in the coming days, the work of RBSS will remain pertinent. Their struggle throws into stark relief the old debates about the power and importance of a free press. Their courageous witness to their city’s undoing raises questions that resonate far beyond the borders of Raqqa: How will the world choose to respond to the larger trends (and deeper roots) of extremism? What is our responsibility in the face of atrocity? And, not least of all, what is the value of a free press? For the members of RBSS, the conclusion is clear—and worth staking their lives on. Sarah AzizaSarah Aziza is a journalist covering issues related to the Middle East, feminism, and human rights. Follow her on Twitter @SarahAziza1 or www.sarahaziza.com.